CATBALOGAN, Samar – Two Samar municipalities were recently added to Zuellig Family Foundation’s partnership program. Coming from a province that have serious health issues, the two municipalities, Daram and Pinabacdao was identified because of the local initiatives and health interventions in their localities. “It is fortunate that the local chief executives of these towns have taken pro-active stance in solving their respective municipalities’ critical health problems. It is their drive and willingness to really work for better health outcomes that their municipalities were chosen” according to Zuellig Family Foundation. Among the criteria for the selection of municipalities were high disease burden such as maternal mortality ratio, infant mortality rate, malnutrition prevalence, sanitation and infectious disease; undermanned and incomplete health facilities and services, Mayor’s and Municipal Health Officers who are committed to improving health status and Mayor’s commitment despite low health leadership. 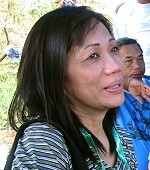 Mayor Lucia Latorre-Astorga of Daram,Samar, a doctor by profession said “that among the challenges they face as local chief executives are insufficient funds, lack of competent health personnel, good health facilities, bad infrastructure that prevent quick and efficient delivery of health services”. Daram is an island municipality where the means of transportation is only by motor boats or banca. “ Our barangays are totally isolated during monsoon seasons and bad weather, thereby making it hard for our constituents to immediately access health care especially during emergency”, Mayor Astorga said. Meanwhile, Mayor Mario Quijano of Pinabacdao, a doctor by profession also, proudly beams that his municipality along with Daram was chosen from 191 nominated municipalities across the country. The list was trimmed down to 27, based on initial studies done by the foundation then finally shortlisted to 12 municipalities. “We (the 12 municipalities) underwent a final selection workshop where we faced questioning by the Foundation’s board of trustees. Thereafter, we were formally accepted by the Foundation as partners for the next two to three years”, according to Mayor Quijano. Among the benefits of the partnership are leadership trainings and workshops, funding for the construction of health facilities, holding of community health summits, other health activities and implementation of appropriate innovative health programs to improve health indicators and outcomes. The 12 municipalities are Bulalacao, Oriental Mindoro; Cajidiocan and San Fernando, Romblon; Minalabac, Camarines Sur; Pilar and Prieto Diaz, Sorsogon; Daram and Pinabacdao, Samar; Leon Postigo, Lapuyan and San Pablo of Zamboanga Del Sur and Tungawan, Zamboanga Sibugay. In working with these municipalities, the foundation aims to help the country to attain Millennium Development Goals in health by 2015, targeting to work with 50 municipalities between 2009 and 2013. These municipalities will be closely monitored by Zuellig Family Foundation to ensure effective program implementation, such are effectiveness in reducing health in-equities, enhancing health information systems, improving health indicators particularly maternal and infant mortality rate malnutrition rate and infectious diseases prevention as well as improving water, sanitation and hygiene systems. CATBALOGAN, Samar – The International Justice Mission - Samar Satellite Office (IJM-SSO) bared its steps against trafficking in persons. In a one-day orientation held at Maqueda Bay Hotel on September 7, 2010, IJM Project Coordinator Elena Morados told the participants that IJM with its partners have conducted inter personal conferences on human trafficking in barangays in the six areas in Samar, namely: Calbayog City, Catbalogan, Gandara, San Jorge, Sta. Margarita and Daram. According to Project Coordinator Elena Morada, the IJM has organized and made functional some 333 Barangay Council for the Protection of Children (BCPC) with partnership from the LGUs, DILG and Plan Philippines. As the two-year project in Samar is about to end, Morada said IJM has done its share in raising the level of awareness of the target areas on the laws on anti-trafficking. Text messages have also been helping them abort trafficking in the areas, said the IJM link. Morada reiterates that parents should not trust even their relatives the care of their children. She added that some relatives may convince parents to send their children to Manila in the guise of looking for jobs with good salaries. Most parents who are hard-up may consider the idea, trusts the relative or any person and later realizes her wrong decision as the child maybe lured into prostitution or illegal job. “Our mission is to protect people from violent forces of injustice,“ bared IJM. It added that it can protect people by securing rescue and restoration for victims and ensuring that public justice systems work for the poor. Samar Satellite office has been established to respond to the high rate of human trafficking in the province. For trafficked victims come from Samar, a book “Seek Justice, Vol 3” published by IJM revealed that 15 of the 64 trafficked victims were from the Visayas region, mostly from the province of Samar and six were from Mindanao. While reasons culled claims poverty was the main cause, Morada said it is the loose family values and adventurism in the young that make them vulnerable to human trafficking. As such, IJM has actively partnered with the Social Welfare Office to strengthen and intensify their Parents’ Effectivity Sessions to guide the parents on how to effectively discipline their children. MAASIN CITY, Southern Leyte – When it rains it pours, but still these were not yet enough to replenish the lost water supply in this city. According to Nestor Geraldo, General Manager of Maasin Water District (MWD), they still have to use the additional pump installed at barangay Nasaug, in addition to existing pumps and the traditional sources of drinking water taken at Canlited in barangay San Jose and Capores in barangay Tagnipa. In a phone Tuesday, Geraldo said they are awaiting results of sent samples of water from the new pump and when this will be proven potable this can supply the water needs of 500 households. There are at present some 3,600 water concessionaires in the service area coverage of MWD from Combado to Soro-Soro to portions of barangay Ibarra, up by 200 from 3,400 when he assumed as head since July last year, Geraldo said. He added that the MWD’s Board of Directors made a policy of not accepting any new water user just yet due to the continuing scarcity of the life-giving element, even as many had wanted to open new connections. Once the new pump will be operational, Geraldo said he would request the MWD Board to have another underground pump installed as a short-term measure to supply the city’s ever-increasing water needs. Aside from this short-term initiative, which involves the installation of at least two deep well pumps, MWD is also considering a long-range plan for a stable water supply in close coordination with the city government. This long range course of action requires the full development and utilization of a huge water potential in barangay Cagnituan, but tapping this seemingly unlimited source would need an estimated cost of P200 Million, Geraldo added. Poems of Imelda Agustin Ruiz of Punta Princesa, Cebu City got the first prize of P8,000.00 while Jhonil C. Bajado of Maydolong, Eastern Samar and Leonilo D. Lopido of Villahermosa, Dolores, Eastern Samar landed second and third place with a prize of P5,000.00 and P3,000.00, respectively. Each of these winners will also receive a Makabenta Diploma and trophies. The awarding ceremony will be held at the HRDC, Alba Hall, Leyte Normal University on October 13, 2010, the 125th birthday of then Eduardo A. Makabenta, Sr. Expected guests who will attend said event are the municipal mayors of Carigara, Barugo, and San Miguel, the towns of Makabentas, together with officials of the province of Leyte. The contest aimed to encourage the youth to write on our own language; give honor to the Waray culture and language; and honor one of the writers who saved our language, Eduardo A. Makabenta, Sr.
QUEZON CITY – Government is spending a total of P8.2 billion next year to aggressively fight infant and maternal mortality, and achieve Millennium Development Goals (MDGs) ahead of the 2015 deadline. Some P5.7 billion will be spent to put up a total of 1,278 Basic and Comprehensive Emergency Obstetrics and Newborn Care Facilities countrywide, according to House Deputy Majority Leader and Pasig City Rep. Roman Romulo. The facilities are meant to significantly minimize the number of newborns and women lost due to childbirth-related and pregnancy complications, Romulo said. Meanwhile, Romulo said another P2.5 billion has been earmarked to vaccinate up to 2.6 million children against measles, neonatal tetanus, Hepatitis B, and hemophilis influenza type B. He said the amount is 152 percent greater than this year's P991-million allotment for the Expanded Immunization Program. The allocations for the new facilities and the inoculation plan are contained in the proposed General Appropriations Act of 2011, Romulo said. "With or without the MDGs, we have to put in check the unacceptably high number of infants and mothers that we are losing on account of childbirth-related and pregnancy difficulties that are, in most cases, preventable, if not manageable," Romulo said. President Aquino is set to attend the September 20 to 22 United Nations (UN) summit in New York, where he is expected to report the country's advances toward achieving the MDGs. The MDGs are eight goals that 189 member-countries of the UN pledged to attain by 2015. Two of the goals are to reduce child mortality and to improve maternal health care. The specific targets include lessening by two-thirds the child mortality rate, immunizing all 1-year-old children against measles, and lessening by three-quarters the maternal mortality ratio. According to the National Statistics Office's MDG Watch, the Philippines managed to reduce the "under-5 child mortality rate" from 80 to 33.5 per 1,000 live births from 1990 to 2008. The target is 26.7 per 1,000 live births by 2015. From 1990 to 2008, the country also lowered the "infant or under-1 mortality rate" from 57 to 24.9 per 1,000 live births. The target is 19 per 1,000 live births by 2015. Over the same period, the country likewise increased the immunization rate of 1-year-old children from 77.9 to 79.2 percent. The target is 100 percent by 2015. As to maternal mortality, the country lessened the ratio from 209 to 162 per 100,000 births from 1990 to 2006. The target is 52.3 per 100,000 births by 2015. TACLOBAN CITY – The Philippine National Police in Northern Samar tagged the Special Partisan Unit (SPARU) of the NPA in the September 13 killing of a police officer of the Catarman Police station. Police Senior Superintendent Brigido Basio Unay, in an interview with the Philippine Information Agency, disclosed that the result of the initial investigations leans towards the SPARU as the assailants. The victim PO3 Geronimo Tan has no personal enemies, the Northern Samar Provincial Police Director said. His being an Intelligence Operative of the Catarman Police Station is the nearest reason why the victim was killed, he added. Col. Unay said that PO3 Tan was already off duty that morning. He was going back to the Catarman Police Station because he had an appointment with someone who wanted to turn in a gun owned by one of the 8 policemen who were ambushed on August 23. It was learned that PO3 Tan was originally from Pambujan, Northern Samar but currently resides at University of Eastern Philippines area. It would be recalled that the day after the ambush of the 8 Catarman policemen, four youngsters aged 14 to 25 were shot at by unidentified gun men while on their way home after watching a concert at UEP. 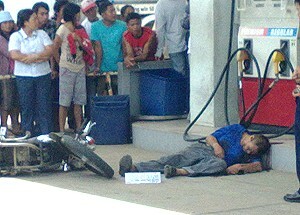 The initial report submitted by Colonel Unay to the PNP regional office stated that at 9:30 in the morning of September 13, 2010, along the National Highway, Tagibian Bridge at Barangay Bangkerohan in Catarman, Samar, one PO3 Geronimo Tan was shot by suspected SPARU hit men wearing helmet, fatigue polo shirt and short pants riding in tandem on a red Suzuki motorcycle. The victim was shot five times by short firearms but he was able to maneuver his motorcycle going to Petron Gas Station at the said place and there he was shot again twice which resulted to his instantaneous death. Luckily, the four youngsters were only wounded. Suspects identified themselves as members of Philippine Army after which they fled going to the direction of Catarman proper, the initial report stated. With the Northern Samar Provincial Police Director orchestrating the operations, the elements of the Catarman Police Station conducted hot pursuit operations against the fleeing assailants while the elements of the Northern Samar Provincial Public Safety Company immediately conducted checkpoints in all entry and exit points of the Catarman area. Nearby police stations were likewise directed to conduct similar police operation for the possible arrest of the suspects. The initial report added that the chief of police of Catarman was ordered relieved by the PNP Regional Office. He was replaced by Northern Samar Asst. Provincial Director Carlo Centenaje, in a concurrent capacity. TACLOBAN CITY – The Philippine National Police in Region 8, during its traditional Monday Flag-raising ceremony, cited four police officers for their commendable performances, a report coming from the PNP Police Community Relations Office stated. The awards were presented PCSupt. Arnold R. Revilla through PCSupt. Drusillo C. Bolodo, Deputy Regional Director for Administration, assisted by PC Superintendent Pio Manito, Chief Regional Police Human Resource Doctrine and Development and PC Superintendent Alfredo Japson Sabornido, Chief Regional Headquarters Service Support Group 8 and at the same time the Keynote Speaker of the day. Among the four awardees was Police Inspector Michael N. Oraller who received a PNP Commendation Medal for his commendable performance in line of duty during the conduct of manhunt operation on June 8, 2010 at Talalora, Samar which resulted to the arrest of Leonilo Lauzon, Rudy Iraya and Ric Quimel, all charged for Murder case. Another awardee was Police Inspector Gemuel S. Cortina who was given a PNP Medal of Merit for his exemplary performance of duty during the conduct of anti-illegal drugs operation on 09 July 2010 at Guimbaolibot Ave., Ward 11, Guiuan, Eastern Samar which resulted in the arrest of Rachhpal Singh and Karamjit Singh and the confiscation from their possession and control of Three Hundred Fifty-Three 353 grams of suspected dried marijuana leaves. The third awardee was PO3 Darwin O. Gilles who received a PNP Commendation Medal for his laudable performance of duty during the conduct of anti-illegal drugs operations on 08 April 2010 at Brgy Tagnipa, Maasin City which resulted in the arrest of Expedito R. Montederamos and the confiscation from his possession and control of 18 sachets of “Shabu” and several drugs paraphernalia. The last but not the least awardee was PO3 Dexter Vincent L. Capuyan for having demonstrated exemplary performance during the conduct of buy-bust operation on 17 June 2010 at Brgy. Punta, Ormoc City which resulted in the arrest of Liza Canin and the confiscation from her possession and control of 3 sachets of “Shabu” and several drugs paraphernalia. PS Superintendent Sabornido, the keynote speaker, expressed his high hopes that the peace and order condition in PRO8 will continue to improve with the cooperation and support of people in the community and the force multipliers. BORONGAN, Eastern Samar – With an allocation of P20M, Macabut bridge of Gen. McArthur town will not only be rehabilitated but permanently concreted. This was said by Congressman Ben P. Evardone in an interview. The then age-old wooden bridge was washed out by a devastating typhoon and it being vital to Eastern Samar’s riding public and businessmen alike who take the southern route to Tacloban and elsewhere in the Region, Cong. Evardone deem it proper to place it on top of his priorities. He said that the Department of Public Works and Highways (DPWH-8) has requested some P2B appropriation and of this, about P500M is budget for Eastern Samar. Cong. Evardone added that the Millennium Challenge Fund (MCF) is intended to massively rehabilitate roads and bridges among others, and he said he is bent not to let up in any of its budget deliberations, fully aware of the serious need for repair and rehabilitation of some portions of Eastern Samar roads. Several portions of the highways of the province (McArthur to Hernani) had been the subject of public’s clamor particularly the Estehanons who are envious of the roads of other regions and provinces. Recently however, some stretches of asphalt overlay had been constructed which has eased the riding public. In fact, some works are on going in some portions of the highway to the south of Borongan. NAVAL, Biliran – Amidst the challenges that lie ahead in the establishment of a center that will facilitate the processing and documentation of all paper requirements for the establishment of a business enterprise as well as a place that will provide would-be investors and entrepreneurs with useful and basic information on various business options, Naval Mayor Susan V. Parilla approved the establishment of a National Economic Research and Business Assistance Center (NERBAC) in the capital town of Biliran province. NERBAC was established by virtue of Republic Act No. 7470 promulgated on April 29, 1992 or the law known as the National Economic Research and Business Assistance Center of the Philippines Act of 1992. On May 11, 2009, the Department of Trade and Industry (DTI) issued Department Administrative Order No. 09-04 which is the Operating Guidelines in the implementation of the NERBAC Law. It was learned during the one-day Provincial NERBAC Orientation and Organization held here recently that Mayor Parilla has sent a letter of intent to DTI-Biliran for the establishment of the center in Biliran province which will be situated in the capital town. NERBAC-Biliran will be temporarily housed at the DTI Provincial Office at the start of its operation while LGU-Naval is still looking for a space that will accommodate the center. However, Mayor Parilla is contemplating of putting NERBAC at the Municipal Treasurer’s Office after its renovation. NERBAC-Biliran will be manned by personnel to be assigned by the mandatory agencies necessary in the process of getting a business permit or license on scheduled basis such as the Bureau of Internal Revenue (BIR), Social Security System (SSS), Philippine Health Corporation (PhilHealth), Department of Trade and Industry (DTI) and Home Mutual Development Fund (HDMF) known as Pag-Ibig, Cooperative Development Authority (CDA) or other agencies applicable in the business process and licensing in the locality. QUEZON CITY – Government has enough resources to thoroughly train and produce highly capable crisis negotiators needed to quell significant hostage-taking incidents and other highly unstable conditions, Cavite Rep. Elpidio Barzaga Jr. said Saturday. In the proposed General Appropriations Act of 2011, Barzaga said the Philippine Public Safety College (PPSC), under the Department of the Interior and Local Government (DILG), is getting some P1.1 billion in fresh funding. "Some of the funds could and should be invested by the PPSC in fully developing a select group of skillful crisis handlers and negotiators, to be drawn from the various law enforcement agencies," Barzaga said. The chief negotiator in the Aug. 23 hostage-taking disaster, Supt. 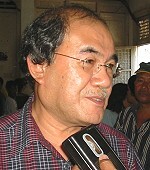 Orlando Yebra, previously acknowledged that the National Police still do not have an official hostage negotiating team. Besides the police, Barzaga said the Bureau of Jail Management and Penology, Bureau of Corrections and the Bureau of Fire Protection should also develop effective crisis negotiators. "Our prisons and jails are extremely vulnerable to highly volatile conditions, such as potential rioting and hostage-taking incidents," he warned. Barzaga said the PPSC should also secure the help of the US Federal Bureau of Investigation (FBI) in training the crisis negotiators. "The FBI has been helping law enforcement agencies around the world in crisis management and negotiations. We should avail of their assistance for the benefit of our own law enforcement agencies," he said. FBI negotiators undergo an intensive special course and are constantly updated by research, case studies and activities designed to build up their capabilities to assess, manage and overcome critical incidents, Barzaga said. Barzaga previously urged the National Bureau of Investigation to establish a new division patterned after the FBI's Critical Incident Response Group, which boasts of 340 professional crisis negotiators. He pointed out that due to the lack of competent negotiators, in the past, government had also bungled several critical incidents, including the recovery of foreigners held hostage in Mindanao. "We are convinced that a strong negotiator, fully and singularly in command of the situation, could have suppressed the Luneta hostage-taking crisis long before it rapidly spun out of control," Barzaga said. Meanwhile, Barzaga said the PPSC is expected to spend some P119 million to provide basic training to the 4,000 additional police, jail and fire officers that government will be recruiting next year to reinforce public safety. Besides hiring 3,000 new police officers, he said the DILG will enlist an additional 500 jail officers, and another 500 fire officers.